One of the worst life events is the personal injury accident. It is unexpected, shocking and disrupts your life and the life of your family. You are unexpectedly in the position where you need to make a quick choice as to who you can get advice from, and who should handle your case. The personal injury practice is not always best left to the large law firm with the T.V. commercials and catchy jingles. Sometimes cases handled that way are assigned a low level of priority and do not get the attention or results needed. Having a local attorney versed in the law, accessible to you and advocating for your cause from the beginning of your case is the key advantage to having your case handled quickly and efficiently. We’ll help you get through these tough times. 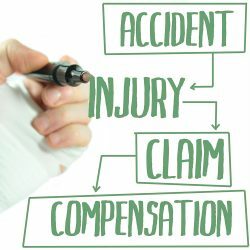 Our firm has handled all types of personal injury cases, including car accidents, motorcycle accidents, slip and fall cases, medical malpractice, dog bites and attacks, and the resultant loss of property. Our firm works to document your case, from the initial meeting with you, throughout the process, preparing your case as if it’s going to trial, not as if we are trying to keep you out of court. Insurance companies, either yours or the negligent person’s, need to know, and be aware that that case will be taken to court if necessary, to enforce your rights. As with the rest of our litigation practice, we will use the courts and discovery process, including depositions and investigations, to advance motions and if necessary the trial for your case. We use experience and professionalism to achieve and maximize your goals. It is important from the onset of your case that critical evidence, such as witness statements, police reports, accident photos, damage photos and your medical records are generated and secured to prove your injury and damages. We offer a free consultation, and recommend that before you “sign” with an attorney, come consult with us, a second opinion may offer insight. We officer contingency retainers for personal injury matters, meaning no fees unless you receive a settlement or collect a judgment. Our clients that know us, have relied on us to handle and prove their cases.